I believe that certain superstitious things we do or keep do have a lot of meaning. Whenever I travel outside Mombasa, I usually take along my precious prayer beads (mala) with me. It precious because my mum had given it to me. I usually carry it in my handbag and always get the feeling that things will be alright and God is with me. However, when we went to Nairobi for our Canadian visa application, I did not carry the mala. The same happened for the subsequent two trips and I feel that all the problems we faced could have been because I broke the norm. Yes I do understand that karma was playing its part but human beings need certain assurances that all is going to be well. Its like a baby hugging its favourite teddy, a comforting blanket, a delicious thumb or like my nephew, he needed those soft labels that one has on the clothes. However, attending a Satyanarayan katha, Shiv pooja and Hanuman Chalisa all at the beginning of Shravan month did help. We finally have got our visas for 8 years and by mid September we will be visiting my younger son in Montreal. And I will not forget to carry my mala. Coming to today’s recipe, I use make palak paneer kachoris very often for the kids when they were little. Paneer is a favourite with most kids and I got them to have a bit of spinach too. The green colour was very enticing for them. These kachoris are a hit with my guests too. Serve them with any chutney of your choice. Add oil and salt to the flour and rub it in well. Add the water and spinach puree to it and form a dough that is not too hard or soft. Cover the dough with a lid or cling film and let it rest for 30 minutes. When it is hot add the cumin seeds, asafoetida and chopped cashew nuts. Stir fry till the cashew turns very light pink. Add ginger, chilli and paneer. Stir and add the salt and sugar. Mix well. Let the filling cool down a bit. Add the lemon juice, coriander, cinnamon and clove powder. Mix well. Divide the pastry dough into 30 parts.The balls should be about the size of a big marble or a nutmeg. Roll each ball into a circle of nearly 3 inches. Hold the circle or puree in your palm and add about 1 to 1½ tbsp of the filling. Bring the edges together into a half moon shape. Twist the edges or press with a fork. You may make round kachoris if your like. Repeat steps 2 and 3 with the remaining dough and filling. When all the kachoris are filled, heat some oil for deep frying over high heat. Test if the oil is ready by putting a small, tiny piece of the dough into the oil. if it comes up immediately the oil is ready. Add 6 to 8 kachoris in the hot oil and half fry them. As soon as they turn white, remove them with a slotted spoon. Repeat with the remaining kachoris. Keep the half fried kachoris on the side till required. Before serving, fry them in the hot oil but this time fry them over medium to low heat till they are light golden in colour. Make sure the pastry dough does not become too soft otherwise the pastry will remain soft on frying. To make spinach puree, blanch the leaves in hot water. Remove the leaves from the water and let it cool. Puree into a course paste using as little water as possible. Blanching is adding the vegetable into the hot water and removing it as soon as the leaves wilt or in a minute or so. The half fried kachoris stay good in the fridge for 2 to 3 days. If you are left with any dough roll it out into a puri and fry. These are delicious, thankyou for sending them to lets cook with cheese event at simply.food. looks super delicious!!! Thanks for linking it to my event!! Looking for more yummy recipes!! 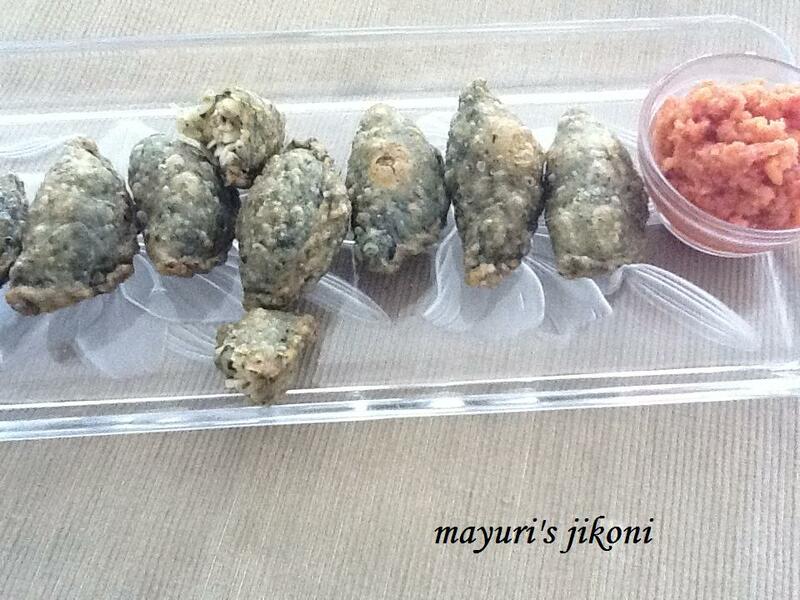 A very diff kachoris indeed .Thanks for linking it to favourite recipes event mayuri .